T & C’s | Wedding Day Shops - Everything you needs for your Wedding Day including: Wedding Favours, Wedding Accessories, Wedding Gift list, Wedding Suit Hire, Wedding Bridal Wear, Wedding Planners, Wedding Shoes, Wedding Stationery, stag and hen night, Wedding Venue, Wedding Directory, Wedding Beauty, Wedding Video, Wedding day Photography, Wedding day Jewellery. Paul Furst and Paul Furst Ltd disclaims any liability to any third party and is not responsible for any actual loss, consequential loss or inconvenience or any actual, special, indirect, or incidental damages, or damages for lost profits, loss of revenue, caused to any user of this web site as a result of any inaccuracy or error within its website pages. Every care has been taken in the compilation of the information contained in web sites by Paul Furst and Paul Furst Ltd. The data and information on web sites by Paul Furst and Paul Furst Ltd should not be relied upon as the complete and appropriate information suitable for the circumstances of any third party seeking assistance or information from the internet. All information or data should be verified directly through formal advice from the originating web site. The information contained within web sites by Paul Furst and Paul Furst Ltd are constantly being developed, updated and amended. Paul Furst and Paul Furst Ltd takes considerable steps to confirm and verify information and to ensure it is correct at time of being published on the World Wide Web. Paul Furst and Paul Furst Ltd will consider suggestions for amendments or updates the web sites at the time that they are received but reserve the right, at any time, to make changes, as it deems appropriate. Whilst Paul Furst and Paul Furst Ltd maintains the web sites and Internet connections in good faith and to a high standard, Paul Furst and Paul Furst Ltd disclaims any warranty express or implied for the maintenance of accurate, complete or appropriate data or the fitness for a particular purpose of any products or services referred to on the web sites. Paul Furst and Paul Furst Ltd does not accept responsibility for any web sites, or any data or information contained on them or the quality of the material provided on web sites that are not owned by Paul Furst and Paul Furst Ltd.
Paul Furst and Paul Furst Ltd operates the servers and equipment supporting Paul Furst and Paul Furst Ltd web sites in good faith. 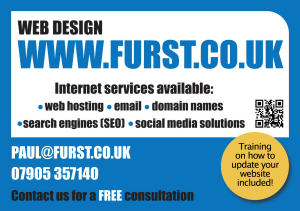 Paul Furst and Paul Furst Ltd accepts no responsibility for damage, loss or changes to any third party equipment (anywhere in the world) as a consequence of access to any server or internet equipment during the download or use of Paul Furst and Paul Furst Ltd web sites or data contained therein. Paul Furst and Paul Furst Ltd employ technology and methods that aim to impede or prevent malicious programs or activity or software virus’ wherever possible but makes no claim as to the effectiveness of such methods and applies no warranty or guarantee (express or implied) that Paul Furst and Paul Furst Ltd web sites are free of such software or activities. Paul Furst and Paul Furst Ltd make no representations, express or implied, as to the accuracy or usefulness of any translation into another language of the information on any site controlled or owned by Paul Furst and Paul Furst Ltd if that translation is not provided by Paul Furst and Paul Furst Ltd as part of my services (including automatic translation services or independent translators not in the employ of Paul Furst and Paul Furst Ltd). Paul Furst and Paul Furst Ltd web site links with a variety of World Wide Web pages that are not owned or controlled by the Paul Furst and Paul Furst Ltd. Such links do not in any way imply endorsement of the activities or contents of the sites that are linked to my own sites. misuse or, misunderstanding of these hyperlinks and hypertext links and web site navigational methods. third party interpretation of data or information which is distributed around the web site and reached using hypertext and hyperlinks. third party understanding of or use of the navigational structure of the site or the interpretation of distributed information on the site. Paul Furst and Paul Furst Ltd may revise this Disclaimer at any time, without prior notice, by updating this web page. 1. assumes responsibility for the use of the information or data downloaded and agrees that neither Paul Furst and Paul Furst Ltd nor any of its employees, agents, members or appointed representatives is responsible or liable for any claim loss or damage resulting from its use. 2. agrees that to proceed beyond the home page of any of Paul Furst and Paul Furst Ltd web sites implies acceptance of these conditions. 3. agrees that use of the information and data contained on these web site pages is at your sole risk. 4. assumes responsibility for ensuring by independent verification its accuracy or completeness. 5. agrees that use of automatic language translation services for translating information found on Paul Furst and Paul Furst Ltd web sites is at the sole risk of the user of the information. 7. accepts responsibility for independently checking for, and dealing with, software virus’ or malicious programs or activities when using any web sites. The web sites owned and operated by Paul Furst and Paul Furst Ltd are protected by copyright owned in whole or in principal part by Paul Furst and Paul Furst Ltd. You may download the document for personal reference, research or information purposes only. Download, distribution and/or alteration of any information or data from Paul Furst and Paul Furst Ltd by any third party for their local use is permitted as long as this copyright is kept intact and appended to any data downloaded. Any other distribution of copies of the document or any altered version thereof is expressly prohibited without prior written consent of a senior officer of the Paul Furst and Paul Furst Ltd.
Use of any logo, graphics or graphical device or picture in any form or media after downloading from Paul Furst and Paul Furst Ltd web sites is prohibited without the express written permission of Paul Furst and Paul Furst Ltd.
Paul Furst and Paul Furst Ltd does not grant permission for any use whatsoever (other than local display on the screen of the downloading equipment) for any information or data for which the Paul Furst and Paul Furst Ltd does not own the copyright. Links connecting this site with other sites are for convenience only and do not necessarily mean that Paul Furst and Paul Furst Ltd endorses or approves those other sites, their content or the people who run them.